Theo's experiments demonstrating that the Apollo Moon landings couldn't possibly have happened are ingenious and compelling. However to put the matter beyond doubt, I offer another line of corroborating evidence. 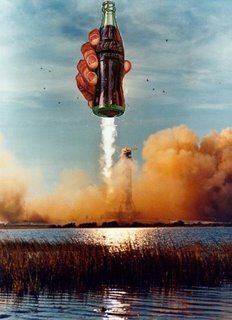 If you look closely, you will see that the "rocket" is in fact a coke bottle. I am frankly amazed that so many so-called intelligent people have been fooled by this blatantly obvious fakery for so long. Thank God for conspiracy theorists. Where would we be without them? Tagged - Conspiracy Theory, Moon Landing, 9-11, Fallacy, Skepticism.